Treats, Play, Love will impress readers of any genre, whether the reader is new to dogs or is an old hand with them. This book should be required reading for every dog owner because the information in it is so unusual, so important, and presented in such a refreshing way through stories and real-life examples that readers can’t help but learn. And finally, if you liked Patricia Gail Burnham’s still-in-print 1980 book, Playtraining Your Dog, which focuses primarily on trainers and training specific actions, you will love this book. The Treats book is written for pet owners who want to help their dogs become good members of the household by understanding how they think, knowing what makes them tick, and accomplishing that by using treats, play, and love. Because the stories and topics in Treats, Play, Love are written with clarity, humor, and human interest, putting the book down once you start reading is difficult; the reading is just too pleasurable and interesting to stop once you get started. Treats, Play, Love is not a rehash of Playtraining or any other material Gail has written; as you turn each page you’ll hear yourself saying, “Wow, I didn’t know that!” or “Wow, I never thought of that!” Treats, Play, Love will teach you much; plus, it’s a 320 page book and is a tremendous bargain at only $14.95. 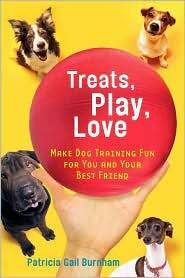 From page two on, Treats, Play, Love becomes very different from Playtraining; it becomes a treasure chest filled with information for pet owners. Lest you are wondering, yes, there is plenty more in the book pertaining to retired racing and AKC greyhounds. There is even essential information for those of us who take on greyhound puppies. Early on, Gail recognized that many shelter pets are those who weren’t taught good manners. As a teenager Gail brought home from the shelter many German shepherds and collies who, after she trained them, remained in their new homes. Gail has an amazing connection with dogs and knows how to communicate with them and conversely, how they communicate with her. After rescuing many collies and brushing endless coats, she decided after her 12 year old collie died that her next dog would be short-haired. She then met Amanda, a whippet, and her daughter Fauna, She loved the breed but always liked bigger dogs so greyhounds were a natural choice. Then Traveler was about to be put down at the shelter. Traveler, a charismatic and gentlemanly greyhound, came home with her and thus began her lifelong journey with greyhounds. The book is organized into 13 chapters written in story-telling style. Included are chapters titled Basic Training for Every Puppy (Growing Up Civilized), House Manners for Older Puppies and Adults (More Useful Things to Teach), and Learning from the Past. The latter chapter gives a concise and interesting history of old-time trainers and delves into compulsive versus inductive training and even into B. F. Skinner’s work and compares food training and kindness versus punishment and pain. This chapter is not dry and academic; it will keep you interested because, like the other chapters, it is conversational and contains informative material for today’s dog owners. In a nutshell, trainers have tended to be apologetic for using food training. This attitude has been fading away; one can see why after reading this book. An important chapter is the one titled Preventing Dog Bites and should be a must-read for every dog owner. If you think you know about dominance, fear and other kinds of biting, pack leadership and how to handle these issues, you may be rethinking your current views on the subject after reading this eye-opening chapter. It is essential reading and it may even save lives. Gail believes that classes are not the place to teach a dog a new exercise; there are too many distractions and chances for failure and not enough time for rewards. Sometimes the best place is at home and working with one dog at a time. So, whether an owner is training a heel or a “go to your bed” or “ears up”, home or away from a classroom setting is the best place to do it. Gail opines that classes are good practice for dogs who‘ve already had some training. Some interesting topics that you may not have thought of are woven into the stories in every chapter. These include, in no particular order: teaching the dog English; the easiest way to teach is naming behaviors; what does a dam teach a puppy, what you should teach a baby puppy as opposed to an older puppy and what each is capable of; when is a bite not a bite or an attack; kinds of bites; what you need to know about house training; when disobedience isn’t disobedience; jumping or not; training for nail care; helping the shy dog; and hereditary personality, which includes breed personality, gender personality, and the nine kinds of individual personality. The last topic is really fun when you try to decide which ones your dogs have! There are too many other topics presented here to list, but I can assure you, they are all interesting, informative, and as unexpected as the ones I’ve listed. A final chapter is titled At the End of a Dog’s Life (The Chess Game), which is a conversation between Gail and Death depicting how she cheats (delays) Death. This chapter describes, among other things, how Gail handles unfortunate circumstances, such as incontinent dogs, dogs that won’t eat, and friends and relatives who say you should put your dog down when you know the chess game isn’t finished. The final chapter is moving and I will not give it away other than to say it’s poetic. The book has an extensive index, making looking up topics a breeze. Buy the book, read it, and refer to it often. You’ll be glad you did.